A 1,300 year-old island in Siberia shocked Vladimir Putin "I have never seen anything like it…"
An ancient fortress called Por-Bajin–or Por-Bazhyn, Por-Bazhyng—has historians and Putin—among many others—completely baffled. No one is quite sure why the mystifying, 1,300-year-old fortress was built on a distant Siberian island, nor why it was abandoned. Discovered a century ago, the mysterious fortress located in distant Siberia called Por-Bajin continues to misty experts and world leaders. The first impression—while looking at the mystery island—is a rectangular fortress or prison in ruins. Built some 1,300 years ago, no one is sure what the rectangular-shaped island and its labyrinthine ruins were used for, nor why it was abandoned. Scientists and historians cannot agree on a single theory. Some believe that the isolated fortress was created in the distant past to attract people there—and not a prison—and was probably used as a monastery, a religion retreat or even as an ancient astronomical observatory. Meaning ‘clay house’ in the Tuvan language, Por-Bajin sits between the Sayan and Altain ranges and is located nearly 4,000 kilometers from Moscow. The island’s location was first uncovered in 1891, and ever since experts have failed to understand its true purpose. In 2007, experts decided to visit the island and take a closer look. Scientists discovered clay tablets of human feet, ancient drawings on the walls and MASSIVE gates. 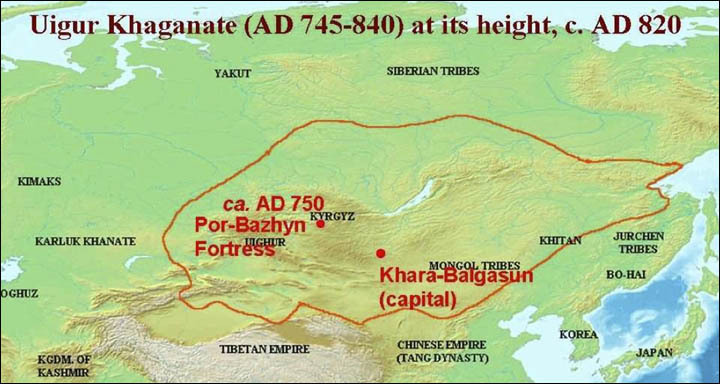 It is believed that the mystifying island was created during the period of the Uighur Khaganate (744-840 AD) however no one knows the exact reason why it was built. Furthermore, what baffles experts, even more, is that fact that island was built in an extremely solitary place, and is located a great distance away from bigger settlements and ancient trade routes. The more experts investigate the more mysterious it gets. Scientists have concluded that based on the way the island was built and taking in count the materials used, ancient Chinese architectural tradition is present. Even though Por-Bajin is believed to date back at least 1,300 years, many of the walls are intact and extremely well-preserved. The main structure on the island—positioned in the inner courtyard—is separated into two parts and is covered by a tiled roof walkway which is held by 36 massive wooden columns placed on stone bases. The Island, its design, its purpose, and practically everything about it is a mystery. Experts have no idea why it was built, but an even greater mystery is why it was abandoned. Scientists have noticed that there is a lack of heating on the island, even though it is located in Siberia and endures periods of extremely harsh weather. The Island is located over 7,000 above sea level. Some experts are convinced that the ancient ruins are reminiscent of China’s ‘Forbidden City’. Professor Heinrich Härke, a specialist in early medieval archaeology said that the layout of the site, similar to an imperial ‘Forbidden City’, and the techniques used for the wall and roof construction are reminiscent of Tang Dynasty ritual architecture of AD 618–907. This has led many to conclude that perhaps Chinese architects and builders were directly involved in the construction of this complex. The island was even visited by Russian president Vladimir Putin, who was accompanied by Prince Albert of Monaco.